You may have seen the little pun I made the other week on our Facebook page…. Dr. Charlie did not enjoy my choice of footwear one day! This could be chalked up to his lack of “cute footwear knowledge”, but it is most likely a result of knowing what your beloved flip flops can really do to your body. What are they for anyways? Flip flops offer some protection from the ground, for example if it is too hot. But that is about it. They were never meant to be worn “full time”…just in places where you can’t wear shoes but don’t want to go barefoot: locker room, community pool or the beach for example. They do not offer protection from sharp objects. Flip flops are also not sturdy and can slip off easily. Case in point: I SEVERELY cut my foot on one summer on a metal post sticking out of the ground because I was wearing flip flops. A few summers previous I broke my foot due to a slip/fall while wearing them. By the way…wearing a cast for 6 weeks during summer is not fun! Flip flops and other types of flimsy sandals also force you to use your toes to grip the sandal better so it doesn’t fall off, which alters your gait (the way that you walk). This will adversely effect your posture and in doing so, reduce the ability for your body to optimally function. 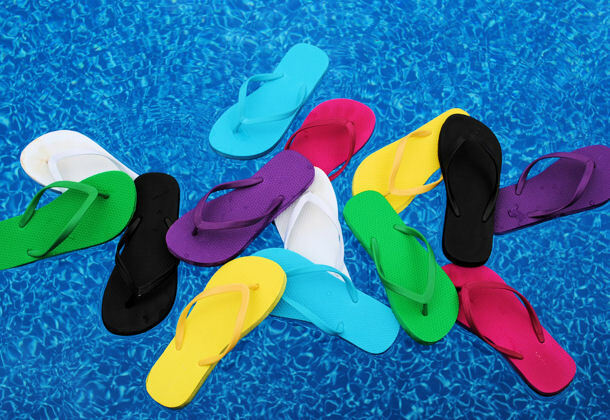 In general, flip-flops do not offer any arch support, heel cushioning or shock absorption. This is incredibly important for those of you who over-pronate, have flat feet or arches that collapse. But why? When you over-pronate, your arches fall and your ankle collapses inward causing internal rotation of the lower leg. This places tremendous stress on the inside of the knee creating an increased risk for a meniscal tear, and predispose you to accelerated degeneration of the knee, aka arthritis. Over-pronation also increases stress on the hip which places the pelvis in an awkward/unnatural position. This, in turn, puts increased pressure on the low back and upward through the spine to the skull! If you didn’t follow all of that, just remember this: The stability of your feet plays a pivotal role in the alignment of your spine, and ultimately your overall level of health. Don’t wear flip flops! If you insist, that is certainly your choice. But know that you are placing your body in a potentially compromised posture that can result in numerous injuries whether acute/traumatic because you lose your footing, or chronic/cumulative as joint degeneration will be accelerated. At least attempt to limit the length of time you walk in them, maybe five to ten minutes or less at a time, and choose a pair that have a thicker sole, tighter straps and some level of arch support. Better yet, consider having custom sandals made. The company we use for custom orthotics can build that custom support right into the sandal for you. Check them out here! ← Your Neck Will Love You for Reading This!